This post was originally posted in 2009. I frequently get requests for this recipe. I get calls from my sister while I'm at Home Depot. I get emails from cousins. Basically, it really is the best apple pie I've ever had. And it all starts with the heels. (Although, I have been told it tastes just as good if you're not wearing heels when you make it.) I've updated the recipe with links to printable recipes. You might want to go ahead and print it so that you don't have to call me and hope I remember the recipe off the top of my head. 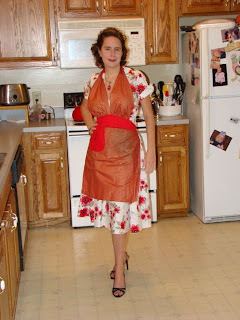 As we all know, the first step in any baking day should be to put on your best '50s dress, heels, and apron. Then, after the pictures are taken, take the heels off and throw them to the side for when the food is ready. Beat egg in cup. Add enough water to fill cup. Add wet ingredients to 'dry' ingredients and mix. Put in pan and set aside. Toss apple slices with dry ingredients until well coated. Cover edges with foil and bake for 25 minutes, then remove. 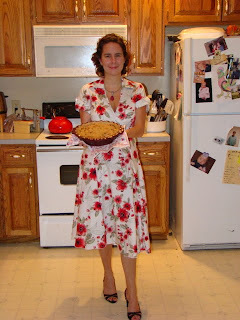 Throw off your apron, slip on your heels, and serve your pie! Lightly beat the egg in a cup. This recipe makes 4 crusts. That means it will make four pies, or two pies with double crusts. It freezes well. Just roll the extra crusts into balls and put them in the freezer. This pie recipe came from a cook book. I think it was Better Homes and Gardens. Sprinkle with crumb topping, or cover with second crust. If you use a second crust, be sure you poke holes in the crust to prevent explosion in the oven. Cover the edges of the crust with foil. Please note: I believe that this recipe can be halved and still provide plenty of topping. I never use all the topping. If the butter is not cold, the crumb topping will stick together and be harder to spread. I love this post and the dress and heals!!! I thought you might. ;D Also, I wrote heals when I was writing the post. The heels are healing, though, right?